Michelle turned 12 a few weeks ago and she wanted a pretty girly cake to share with her friends at her party. 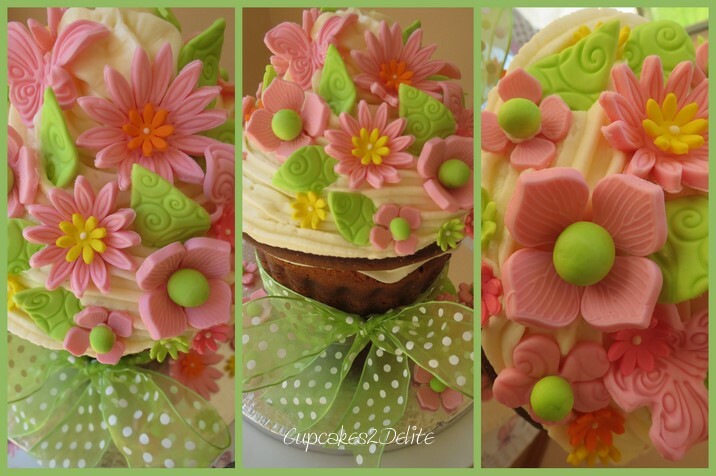 I made the giant cupcake cake for her and iced it with a creamy vanilla icing before adding flowers and butterflies in pink and lime green. I added a few orange and yellow blossoms and lime green embossed leaves to make her cake really pretty. I wrapped a green ribbon with white polka dots around the middle of the giant cupcake cake and added some flowers around the base of the bow to complete the cake. Hope you had fun at your party Michelle! Totally stunning – I LOVE it – gorgeous colours …… beautiful, beautiful and beautiful!! Thanks Wendy, the lime green and pink seem to be my most popular colours and the decorations always turn out well in these colours!